Risk roundup – Our Down-Under friend Russell Hutchinson of Chatswood moneyblog posts this week’s Cavalcade of Risk, with a global roundup of posts. Check it out. Costs for Employees – Insurance Journal reports on the latest Bureau of Labor Statistics report on the cost of U.S. employees, noting that the nationwide average cost for private industry employers was $28.80 per hour worked in June 2012. “The costs ranged within each region, with total compensation costs of $24.44 in the East South Central division to $33.47 in New England.” The article offers more detail on the report, noting that costs were collected from a sample of 47,400 occupations from about 9,500 establishments in private industry. Data excludes self-employed and farm and private household workers. Physician Dispensing – Joe Paduda looks at potential conflict of interest issues in a post about ABRY Partners, he asks, “How is it that an investment firm owns stakes in a TPA, MSA company, subrogation firm – and a physician dispensing and billing company?” Is one company cleaning up a mess that another company makes? In other repackaging news, he notes that Miami-Dade Schools has taken a stand on physician-dispensed repackaged drugs – they are refusing to pay the markups, a move that saved more than half a million dollars. Employers take note: Is this a potential area of savings in your comp program. Narcotics Studies – Rita M. Ayers reports on a recent study by Accident Fund Holdings and Johns Hopkins University that links opioid use to an escalation in overall claim cost in the Tower MSA Blog. She notes that the study reveals that 55% to 85% of injured workers receive narcotics for chronic pain. She says that the study, “…examined the interrelationship between the utilization of short- and long-acting opioid medications and the likelihood of claim cost escalating to a catastrophic level (> $100,000). 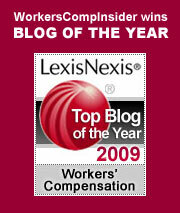 Analyzing 12,000 workers’ compensation claims in Michigan during a four-year period, the study focused on whether the presence of opioids alone accounted for the cost increase or whether costs increased because opioids were associated with known cost-drivers, such as legal involvement and injury severity.” Related: WCRI: Nearly 1 in 12 Injured Workers Who Started Narcotics Still Using 3-6 Months Later. Worst States for Lawsuits – “Lawsuit Climate 2012″ is a study evaluating how fair and reasonable states’ tort liability systems are perceived by businesses in the U.S. It was conducted by the U.S. Chamber Institute for Legal Reform. According to those surveyed, Delaware has the best legal climate for businesses.See respondents’ picks for the Top 10 Worst States for Lawsuits, along with more on the study’s results. Should workers’ comp pay for medical marijuana? Addendum As a follow-on to yesterday’s post about Shackleton’s Medical Kit, we found more information and a photo of Shackleton’s medical kit at The Science Museum of London, and a related post from NPR’s Health Blog: ‘Cocaine For Snowblindness’: What Polar Explorers Packed For First Aid. Risk Roundup – Political Calculations blog hosts this week’s Cavalcade of Risk, replete with a post rating system. Check it out. Florida repackaged drugs issue redux – Dave DePaolo posts about a new effort to put a price cap on Florida’s repackaged drugs. He posits that changing economic and regulatory conditions might create a more favorable climate for passage. He also talks about how “capping the price of drugs has been hotly contested by the Florida Medical Association (FMA) and a company called Automated Healthcare Solutions (AHCS).” AHCS is a firm whose executives have contributed heavily to politicians to prevent such legislation. A Tampa Bay news report talks about how the state’s pill mill crackdown was held up by proponents of doc dispensing, including AHCS principals: “The two Miramar workers’ compensation doctors have helped pump about $3 million into the political system through a dozen companies in the past year.” A story in the Florida Independent covers an earnings report for top lobbyists, noting that, “Among the companies to have spent the most on lobbying is Automated HealthCare Solutions, a group whose co-chairmen have become fixtures on the political scene. According to the Current, Automated HealthCare has posted minimum lobbying expenditures greater than $300,000.” For more on why repackaging controls are needed, see Joe Paduda’s posts: Drug Dispensing by Docs and Repackagers and the myth of AWP. The big five – Roberto Ceniceros reports that Top 5 workplace injury causes make up 72% of direct workers comp costs, according to a research report by Liberty Mutual Group. “Overexertion–or injuries caused by lifting, pushing, pulling, holding and carrying–costs businesses $12.5 billion in direct annual expenses and accounts for more than 25% of the national burden.” This was followed by falls on the same level, falls to a lower level, bodily reaction, and struck by object. Health Wonkery – Christopher Fleming hosts Health Wonk Review Unadorned at the Health Affairs Blog. Check out the latest from the best of the health policy bloggers. And if healthcare is of concern to you, Health Affairs should be a regular read! Bad behavior – When it comes to bad behavior, we are equal opportunity finger pointers. We’ve seen fraudulent employees. We’ve seen terrible bosses. We’ve seen bad brokers, bad insurers, and quack docs. Fraud is a game everyone can play and no one has a corner on the stupidity market. Among the recent crop of losers, we start with a post from HR Web Cafe about a mean-spirited employer who got a smackdown from a labor judge for a rather unusual contest he used to “motivate” his workers to better performance. And also on the employer side of the house, we have a classic case of premium fraud by a California tree trimming business that failed to pay workers comp premiums, under-reported payroll by more than $2 million, and failed to pay taxes. On the employee side, Roberto Ceniceros tells the story of nightmare employees who let rage over a small thing turn into a tragic event. Spying on Employees – Employment law attorney Heather Bussing offers some useful guidelines on employee privacy and what employers can monitor. This is a really good overview. We encourage reading the entire article. Here’s some of her take-aways: “If the employer owns the system, hardware or both, the employer can monitor employees’ use of it, including personal files and communications. Repackaged Drugs – Joe Paduda has been in the forefront of a crusade against the practice of repackaged drugs, which has been promoted as a convenience for patients, but in practice is a costly work around for fee schedules. This is one of those under-the-radar issues that many employers may not see, but in states where the practice is allowed, it is costing big bucks. Joe first talked about the practice in 2006, and has been regularly posting updates. He brings you the latest from the eye of the storm: Is Florida finally going to fix its (repackaged) drug problem? Child Workers – Celest Monforton gets the bureaucratic runaround when she tries to find out why child labor regulations were delayed by the White House’s Office of Management and Budget. A Labor Department update to the 40-year old regulations were stalled for 9 months – meanwhile, two teens lost legs in a grain auger accident, precisely the type of event that made such an update to regulations imperative.